Wile, D. B. (1978). Is a confrontational tone necessary in conjoint therapy? Journal of Marriage and Family Counseling, 4(3), 11-18. Wile, D. B. (1979). 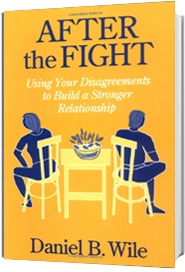 An insight approach to marital therapy. Journal of Marital and Family Therapy, 5(4), 43-52. Wile, D. B. (1985). Phases of relationship development. In D.C. Goldberg (Ed. ), Contemporary Marriage: Special Issues in Couples Therapy. Homewood, Ill., Dorsey Press. Pp. 35-61. Wile, D. B. (1994.) An ego-analytic approach to emotion in couples therapy. In Johnson, S. M. & Greenberg, L. S. (Eds.). The heart of the matter: Perspectives on emotion in marital therapy, pp. 27-45. New York: Brunner/Mazel. Wile, D. B. (1995.) An ego-analytic approach to couple therapy. In Jacobson, N. S. & Gurman, A. S. (Eds.). Clinical handbook of couple therapy, pp. 91-120. New York: Guilford. Wile, D. B. (1999.) Collaborative couple therapy. In Donovan, J (Ed.) Short-term couple therapy. New York, Guilford, pp. 201-225. Wile, D. B. (2000.) Opening up a second level in the relationship. The Los Angeles Psychologist. Publication of the Los Angeles County Psychological Association, November-December issue, pp. 8-9. Wile, D. B. (2002). Collaborative couple therapy. In Gurman, A. S. & Jacobson, N. S (Eds.). Clinical handbook of couple therapy, Third edition. New York: Guilford, pp. 281-307. Wile, D. B. (2008). 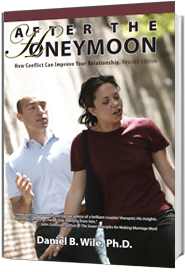 After the Honeymoon: How Conflict Can Improve Your Relationship, Revised Edition. Oakland, CA: Collaborative Couple Therapy Books. Wile, D. B. (2011). Collaborative couple therapy. In Carson, D.K. & Casado-Kehoe, M. (Eds.) 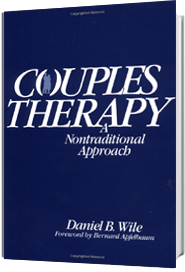 Case studies in couples therapy: Theory-based approaches. New York: Routledge. pp. 303-316. Wile, D. B. (2013). Opening the circle of pursuit and distance. Family Process, 52, 19-32. In this article, published in Family Process. (In this article, I describe the circle of stages involved in a pursuer-distancer interaction and give an example of therapy with such a couple). Wile, D. B. (1972). Negative countertransference and therapist discouragement. International Journal Psychoanalytic Psychotherapy, 1(3), 36-67. Wile, D. B. (1975). Personality styles and therapy styles. Psychotherapy: Theory, Research and Practice, 13(4), 303-307. Wile, D. B. (1977) Ideological conflicts between clients and psychotherapists. American Journal of Psychotherapy, 31(3), 437-449. Wile, D. B. (1984). Kohut, Kernberg, and accusatory interpretations. Psychotherapy: Theory, Research, Practice, and Training, 21(3), 353-364. Wile, D. B. (1985). Psychotherapy by precedent: Unexamined legacies from pre-1920 psychoanalysis. Psychotherapy: Theory, Research, Practice, and Training, 22(4), 793-802. Wile, D. B. (1987). An even more offensive theory. In W. Dryden (Ed. ), Key Cases in Psychotherapy. London: Croom-Helm. Pp. 78-102. Wile, D. B. (1977). Questioning Sperry’s bridge from brain to mind to values. American Psychologist, 32(11), 987-988. (A comment to an article by R. W. Sperry). Wile, D. B. (1984). The nature?nurture issue in psychoanalysis: A review of Object Relations in Psychoanalytic Theory by Jay R. Greenberg & Stephen A. Mitchell. Contemporary Psychology, 29(11), 885-887. Wile, D. B. (1985). Hidden moralism in psychoanalysis: A review of How Does Analysis Cure? by Heinz Kohut. Contemporary Psychology, 30(7), 536-539. Wile, D. B. (1986). The Occupational Hazards of Psychoanalysis: A review of Transference and its Context: Selected Papers on Psychoanalysis by Leo Stone. Contemporary Psychology, 31(4), 278-279. Wile, D. B. (1986). A snapshot of psychoanalytic theory in the mid 1980ies: A review of Beyond Freud: A Study of Modern Psychoanalytic Theorists, edited by Joseph Reppen. Contemporary Psychology, 31(10), 775-777. Wile, D. B. (1987). A Master of Indirect Communication: A review of The Wisdom of Milton H. Erickson by Ronald A. Havens. Contemporary Psychology, 32(11), 960-961. Wile, D. B. (1988). What Couples Therapists are Doing These days: A review of Clinical Handbook of Marital Therapy, edited by N. S. Jacobson & A. S. Gurman. Contemporary Psychology, 33(2) 108-110. Wile, D. B. (1988). In Search of the Curative Principle in Couples therapy: A Comment on Greenberg, James, and Conry’s article, Perceived Change Processes in Emotionally Focused Couples Therapy. Journal of Family Psychology, 2(1), 24-27. Wile, D. B. (1989). Psychoanalysis as remedial education: A review of The Mind in Disorder: Psychoanalytic Models of Pathology, by John E. Gedo. Contemporary Psychology, 34(10), 945-946. Wile, D. B. (1990). Do couples recreate mother-child relationships: A review of In Question of the Mythic Mate: A Developmental Approach to Diagnosis and Treatment in Couples Therapy, by Ellyn Bader and Peter T. Pearson. Contemporary Psychology, 35(7), 710-711. Wile, D. B. (1991). Healing the schisms in psychoanalysis: A review of Drive, Ego, Object, & Self: A Synthesis for Clinical Work By Fred Pine. Contemporary Psychology, 36(9), 790-791. Wile, D. B., Bron, G.D., & Pollack, H.B. (1970). Preliminary validational evidence for the Group Therapy Questionnaire. Journal of Consulting and Clinical Psychology, 34(3), 367-374. Wile, D. B., Bron, G.D., & Pollack, H.B. (1970). The Group Therapy Questionnaire: An instrument for the study of leadership in small groups. Psychology Reports, 27, 263-273. Wile, D. B. (1972). Nonresearch uses of the Group Therapy Questionnaire. (1972). In Pfeiffer, J.W. & Jones, J.E. (Eds), The 1972 Annual Handbook for Group Facilitators. Iowa City: University Associates, Pp.87-89. Wile, D. B. (1973). What do trainees learn from a group therapy workshop? International Journal of Group Psychotherapy, 23(2), 185-203.